- Large LCD 6 digits with backlit. - Measuring by the output of red visible-spectrum light. - Memory of 200 data. ±0.5%rdg. Is added to above-mentioned accuracy. - USB datalogger up to 30,000 data (TM-4100D). 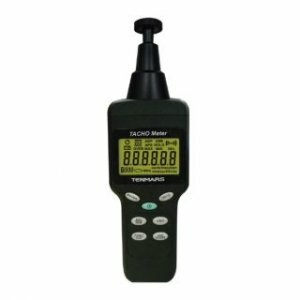 TM-4100 Tacho Meter can be used for various types of equipment such as conveyors, cooling equipment, dryers, elevators, windmills, rotary feeders and grinders. It is available for contact (with 4100K tool kit) and non-contact applications. The non-contact can measure from up to 500mm. - Auto-range - Average - Max/Min. - Auto Power Saver - Hold. - Buzzer (on /off). Output the red visible-spectrum light containing the signal to the tape or plate and receiving the signal from the reflective light. The LCD displays "RING" with a buzzer sound ( or off). Over 10, 000 count, AVG "ON" :+/-2 dgt. ; AVG "OFF" :+/-20 dgt. 0 ~ 40º C; 25% to 75 % RH. -10 ~ 60º C; 0% to 80% RH. USB datalogger: 30,000 data sets.